Locate the probe at the mid-belly of the calf, capturing the Gastrocnemius and Soleus (GS). The probe is placed across the calf, not up and down. Move the probe side to side so the mid-point gastrocnemius is in the center of the image. It often forms a point. If the top of the Soleus muscle is very close to the skin, move the probe vertically so that the Gastroc muscles are larger. 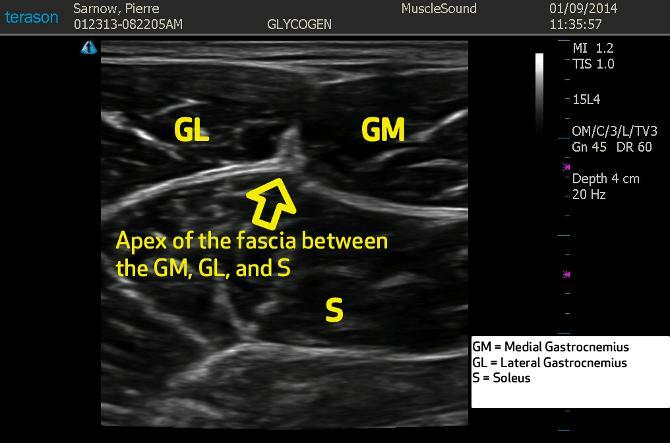 Tilt the probe to show bright continuous fascial boundaries.